This month we have the pleasure of interviewing Yuriy Krvavych from Ukraine. 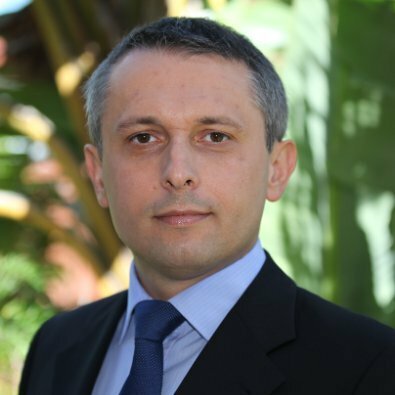 Yuriy Krvavych has professional experience in actuarial work, risk management, consulting and research in insurance and finance, with fourteen years of experience working in the general insurance industry. He currently works for Price Waterhouse Coopers and provides consulting services to the Lloyd's market and London company market in enterprise risk management including Risk and Capital Modelling, Model Validation, Advanced Risk Analytics and Reporting, Capital Model Use and Solvency II, ORSA, Risk Management Framework and Corporate Governance. He previously worked at Insurance Australia Group (IAG) as a DFA and Capital Modelling manager. Prior to IAG, he worked for seven years in the general insurance sector - Hollard Insurance (Sydney) and Oranta Insurance (Kiev). He also taught actuarial courses at the Australian School of Business of the University of New South Wales and is currently serving on the ASTIN Committee of the International Actuarial Association. He holds a Ph. D. in Actuarial Studies and is a Fellow of the Society of Actuaries of Ukraine. He plays the violin and enjoys tennis, volleyball, football, fishing, hiking and cycling. .
YK: Actuarial Science was first introduced in Lviv, Western Ukraine in 1909. YK: Being able to assess and model risks in insurance, finance and social science. YK: Two hydrogen atoms walk into a bar. One says, "I think I've lost an electron." The first replies, "Yes, I'm positiveâ€¦"
YK: Actuarial Science was first introduced in Lviv, Western Ukraine in 1909. There are records of Ukrainian actuaries who participated in the International Congress of Actuaries during the period from 1909 to 1939. The actuarial profession was prohibited in Ukraine during Russian Soviet occupation (1939-1991). The Society of Actuaries of Ukraine (SAU) was established in 1999 after Ukraine regained its independence. YK: Improve professional actuarial standards and become a full member of the International Actuarial Association. YK: Actuarial programs within university specialization in Mathematics/Statistics are available in : Kiev, Lviv, Kharkiv and Odesa. Part 2 exams (local Ukrainian exams jointly administered by SAU and the Ministry of Finance of Ukraine).